The US is no stranger to fatal railway accidents: over the last decade, dozens of lives were lost, and hundreds of people injured in train wrecks. All this is due to lack of funding, infrastructure and development, critics say. The latest Amtrak train crash has left at least six people killed and dozens injured, with the cause of the crash remaining unknown. It came on the eve of the railway budget bill that could see the funding for Amtrak slashed by 20 percent, from $1.4 to 1.13 billion. In comparison, China’s railway budget for the next fiscal year is an estimated $128 billion, the Atlantic news portal reported. The issues that the rail system faces in the US are an alleged lack of the federal commitment to build the high-speed efficient transport links, plus crumbling infrastructure – the latter even became the focus point of a recent documentary ‘Falling Apart’ on CBS. The documentary stated that the flailing transport system is largely due to “decades of neglect” by the government. A striking example that the film provided was that 70,000 bridges in the country need to be either replaced or dramatically repaired. Another problem of the rail system is population density: the US is far less dense than, for instance, Spain or France. Nevertheless, even in the most densely-populated areas of the country, the railway network has been reported slow and inefficient. Over the last decade, the US has witnessed several major train wrecks that caused both casualties and, in some cases, a serious impact on the environment. In April 2002, a train crash in Crescent City, Florida, killed four people and left 142 injured when 21 cars of Amtrak train derailed due to broken brakes. Days after that crash, another one in Placentia, California, left two people dead and 22 injured. In 2003 and 2005 in Chicago, two Metra train crashes left two people killed and almost a hundred injured, having occurred at the same spot. The engineer, who was responsible for the first crash after he sped despite warnings, carried on working for the US railway system. A major chain reaction crash involving six vehicles and a 50-car train in Lafayette, Indiana, in 2008, left two people dead. The rural crossing where the accident took place has seen five other fatal crashes since 1984. Later that year, the Chatworth train collision left 25 killed and 135 injured. Two trains crashed head-on and the incident prompted new safety regulations on railway, Positive Train Control, which was signed just a month after the crash. In November 2009, 116 cars of Union Pacific Railroad derailed, causing a major transport links closure for several days. Three years later, the Midland train crash in Texas left four killed and 16 others injured, hitting a parade float headed to an event dedicated to war veterans. In 2013, the Fairfield train crash saw 60 people injured, five of them critically, when a Metro-North commuter train derailed and crashed into a second train in Connecticut. In December later that year, a major derailment happened at Spuyten Duyvil, New York City, when the conductor fell asleep, with four killed and 63 injured in the crash. 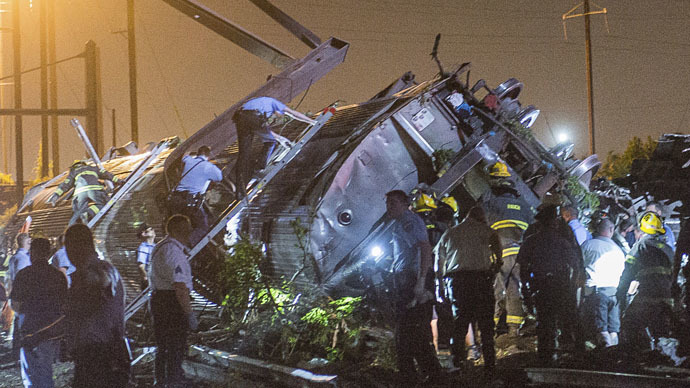 Over 2014, about 25 derailments were reported across the country, causing dozens to be injured. In January this year, a deadly train wreck was reported near Odessa, Texas, in which at least 10 people were killed. A month later, a New York Metro-North train hit a car and caught fire, killing six people, while in March an Expo Line train in Los Angeles collided with two cars, causing at least 21 injuries.